Jābir ibn ‘Abdillah (رضي الله عنهما) reported that Allah’s Messenger (صلى الله عليه وسلم) went out to Makkah in Ramadān in the Year of Conquest; he and the people fasted till he came to Kurā’ Al-Ghameem and the people also fasted. He then called for a cup of water which he raised till the people saw it, and then he drank. (Muslim, 1114) This occurred when the people were uncertain regarding whether they should break their fast even though they were suffering from thirst during the journey, so the Messenger (صلى الله عليه وسلم) led by example and the people followed. Likewise, with our children, the parents must lead by example; make haste with good deeds and be foremost in studying the religion; putting to one side tiredness and sleep for the good of the children; side-lining the purchase of goods that are non-essential so the money is better spent on the children’s Islamic schooling, family ‘Umrahs, conferences, classes, and Islamic library, etc. Your children will remember this model and duplicate it for their own children. Bad conduct is also duplicated, so beware of negligence, laziness, being late to pray, avoiding gatherings of knowledge, eating what is harām, listening to what is harām, watching what is harām, earning from what is harām, because the children will follow you in that. 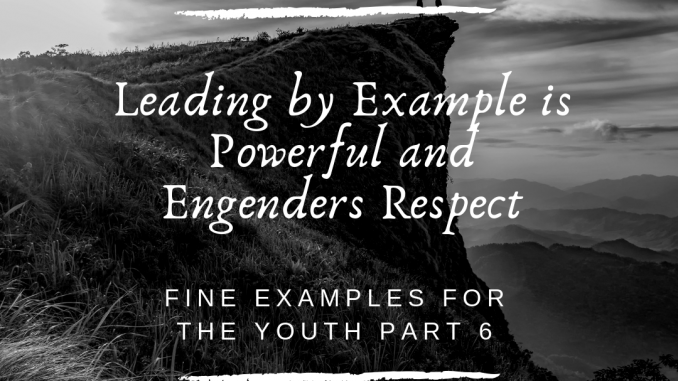 In essence, the actions of the parents and their example are real key indicators to the children as to what is allowed and tolerated and what is disallowed. So, the cultivation through example quite often has a greater effect than preaching, encouraging and warning. A child seeing someone that he loves, honours and respects behaving in a noble manner, following the Qur’an and Sunnah, being truthful at all times, kind and charitable, uncompromisingly avoiding bid’ah and misguidance, and displaying bravery and courage has an immense effect on his/her upbringing and his capacity to be a good parent himself in the future.